Great news! 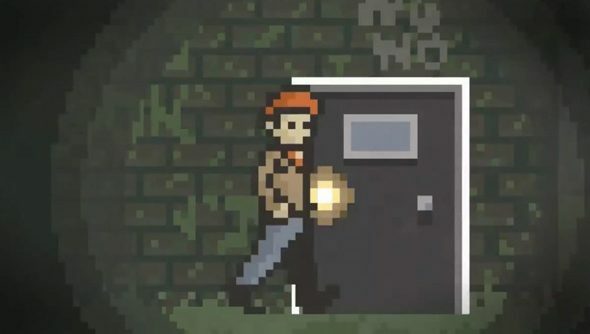 Tiny, pixellated, indie horror underdog Home is coming to Steam tomorrow. Previously available to purchase on the author’s site, Home is a lovely, charming, delightful, dark and upsetting story of a man who wakes up in a spooky house, a story that soon twists and contorts itself into a clever murder mystery and a confused plot that’s ultimately open to player interpretation. Home coquettishly tempers its own exposition so much that there’s an entire webpage dedicated to fan theories as to what, exactly, happens in the bloody thing. Home’s not just a muddled jigsaw plot though. It deftly toys with the player-protagonist relationship, the notion of agency in a retrospective narrative, the objective versus the subjective, plus there’s also a few scary bits in a basement. Though you’re in control of the main character throughout, as you progress through Home’s desolate and badly lit environments you become increasingly detuned to the protagonist’s actions and thought processes until that control over him feels weird and arbitrary. It’s less experimentally abstract than The Stanley Parable, but similarly brief. Itrewards you for exploring and investigating objects by slipping you scraps of plot-truth, nuggets of bedrock on which you might build the foundations of your own interpretation of the game’s plot and outcome. To be any more particular about that plot would rob Home of some of its entertainment. Here’s the Steam page, I can highlyrecommend a download when it launches tomorrow evening.